This post was written by guest blogger Brandy King of Knowledge Linking. After spending eight years working with research on children and media, Brandy now faces the challenge of raising two young boys in our media-saturated and commercialized world. Since it’s my first year with a child in school, I’m new to the “Valentine’s Day Party Procedure.” But I received a notice giving me precise instructions on what to do (and not do) to help my child participate in the celebration. If he wants to give out cards, he can bring one in for every child, signed with his name (but without their names written on them), and if we attach any food items they have to be from the approved snack list because of allergies. When I was at the grocery store today, I glanced at the Valentine spread and saw that the ONLY options for card kits were covered in licensed characters. I quickly decided we’d be making our own Valentines, which I always thought was more fun anyway. 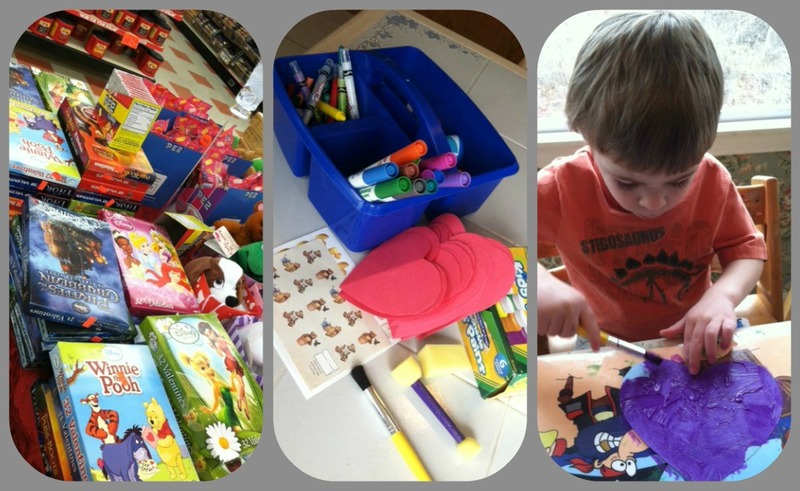 I headed home, cut out 17 red construction paper hearts, and set up our kitchen table with paints and stickers. My son could not have been more excited about this art project. He chattered on about how he would make some extras for his teachers, how he would manage to carry them all, and how he would hand them all out. He worked diligently all afternoon with several breaks and at the end he had created a grand total of 6 of them. It’s going to be a long few days working up to 17! But I could see the pride and excitement in his eyes when he saw them all laid out to dry on the dining room table. Inspired by the day of watching him create, I finally caved and joined Pinterest, the online community for saving and sharing images and ideas from around the web. My goal was to create a board of cute Valentine craft ideas for you all to rival the option of mass-market commercialized card kits. Check out these great Valentine crafts you can make with your kids this weekend. Share your ideas or a link to your own Pinterest board in the comments below! I had the same cringe-worthy experience in the store around pre-made cards. But, thankfully, my daughter spotted a set of dinosaur cards that were completely licensed-character-free...and they're educational! because i am not really that creative. My kids much better on creating. Without the names on them? That part's bizarre. No problem with expecting them to give a card to every child, which I grew up with, but it doesn't make sense to not put names on them. Although I loved art projects as a child, I never created handmade valentines for my entire class, only for favorite teachers and close friends. You are to be commended! Except for fifth and sixth grades, when I gave Peanuts (the only licensed characters I liked) cards, I gave "Valentines for Girls" in grades K-4. These (and "Valentines for Boys") came in books of vintage-looking designs that I thought would be around forever, but were probably out of print before I finished high school. Aside from the gender stereotyping, they were great! I don't have children myself, but have certainly noticed in the Valentine's Day sections at grocery stores that everything is covered with licensed characters: if I had children, I'd probably be making homemade valentines too. Of course, perhaps the real question is whether commercial-free parents should encourage their children to celebrate Valentine's Day and other "Hallmark holidays" at all. . . I glanced at the Valentine spread and saw that the ONLY options for card kits were covered in licensed characters.